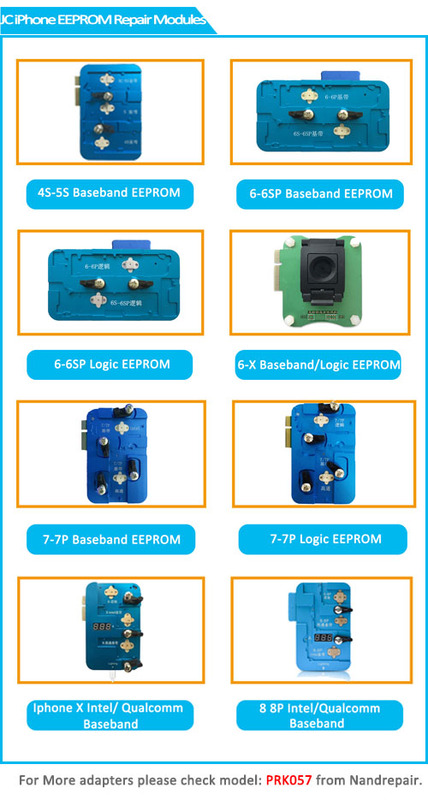 If you need an iphone baseband logic Eeprom iC programmer for underlying data reading and re-writing, you have to know these 8 Kinds of iPhone EEPROM Repair modules for JC Pro1000S. as we know, the iphone motherboard is too hard to repair it, especial for Iphone X or above Version. Dual PCB board Increased difficulty for phone repairers. Therefore, The professional phone maintenance tools are more important for us. JC pro1000S is a professional and Multi-functional Phone repair Programer. it comes with many kinds of iPhone EEPROM Repair modules to To meet different models of iphones. The newest model is Iphone 8/8P/X Intel/Qualcomm Baseband Logic EEprom Reading Re-Writing Module. 1. iPhone 4S/5/5C/5S Baseband EEPROM Repair Tool: Read/ Backup/ Burn on EEPROM IC information in 1 second.Support: iPhone 4S/ 5/ 5C/ 5S. 2. JC iPhone 6/6P/6S/6SP Baseband EEPROM Chip Non-Removal Repair Module: for repairing iPhone 6 6P 6S 6SP Baseband EEPROM chip without removing the chip from the main board.works on JC PRO1000S. 3. iPhone 6/6P/6S/6SP Logic EEPROM Chip Non-Removal Repair Tool: Support for iPhone 6/6P/6S/6SP，It works on JC PRO1000S. 4. iPhone Baseband/ Logic EEPROM Chip Repair Socket Tool is for repairing iPhone 6/ 6P/ 6S/ 6SP/ 7/ 7P/8/8P/X Baseband and Logic EEPROM chips. 5. iPhone 7/ 7P Baseband EEPROM Module: Support for iPhone 7/ 7P, suitable for both Qualcomm and Intel EEPROM chips. 6. iPhone 7/ 7P Logic EEPROM Module: JC LE-7P is for repairing iPhone 7 7P Logic EEPROM chip without removing the chip from the main board. 7. Intel/ Qualcomm Baseband/Logic EEPROM IC Reading/Re-Writing Module For Iphone X: suitable for both Qualcomm and Intel EEPROM chips. 4. The digital tube displays the current, and the main board is short-circuited at a glance. What is the function of JC Pro1000S Baseband Logic Eeprom IC Modules? 1. The JC Pro1000s EEPROM programmer can be available for all iPhone models repair: 4S, 5, 5C, 5S, 6, 6 Plus, SE, 6S, 6S Plus, 7, 7 Plus, 8, 8 Plus, X. How To Use JC T8 NAND Motherboard Repair Tool?